Description: Bare trees against a winter sky inspired the Branches. This Handkerchief Branches pendant features Clear glass drizzled with Midnight Black. 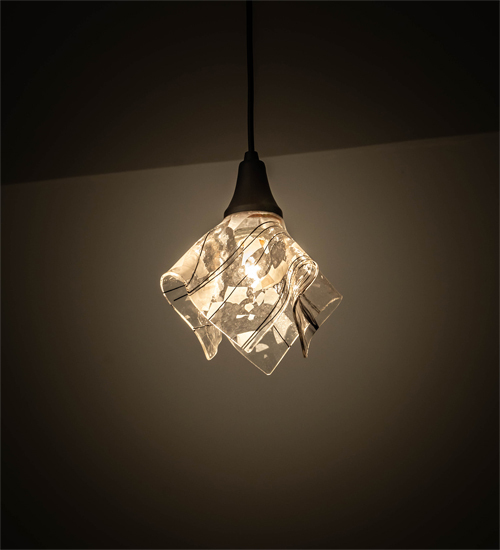 The art glass is high fired to fall into a flowing draped fabric shape. The shade is complemented with Textured Black hardware and a matching cord. The overall height of this pendant ranges from 13 to 85 inches as the cord length can be easily adjusted in the field to accommodate your specific lighting application needs. Handcrafted by expert artisans in our 180,000 square foot manufacturing facility in Yorkville, NY. Custom finishes, styles and sizes are available. Dimmable energy efficient lamping options are offered. UL and cUL listed for dry and damp locations.